When you make a December donation I will personally donate $50 to the All Out for Change® College Access Fund that helps less privileged 12th graders pay for college application fees and visits to colleges. It’s my way of honoring my parents who both came from poor families and achieved upward mobility at a time when it could be done without even finishing high school (my Dad dropped out in 10th grade). I was blessed by their success and ability to go ALL OUT for my education. They acquired the resources to invest in a better future for me, and likewise All Out for Change® goes ALL OUT for our disadvantaged youth who deserve to achieve their potential when upward mobility without a college diploma is barely feasible. Imagine being in their shoes. Help us reach our goal of $5,160 by December 31 to fulfill the equipment wish list (tents, gloves, coolers, camp stoves, lanterns, cameras, and more) of our favorite youth development organization. This winter and spring the 6th - 12th graders will go on camping trips participating in outdoor recreational activities such as kayaking, canoeing, hiking, and biking, and in environmental education, team building and professional development. Help us give them opportunities, support, and resources their wealthier peers benefit from to push the envelope, grow, become competitive college candidates, and achieve their potential. 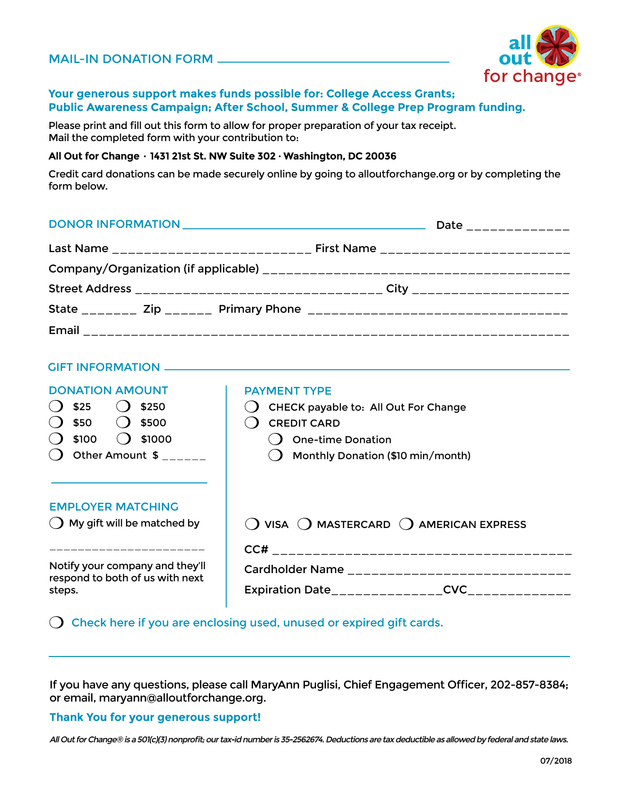 If you receive gift cards this holiday season, please consider sending them to us to support our College Access Fund. CLICK HERE TO DONATE GIFT CARDS. Read About An Inspiring Success Story! Anthony, the aspiring opera singer and recipient of our first 2017 College Access Grant, accepted a full scholarship to Oberlin Conservatory of Music. He used the grant for applications to 7 schools and travel expenses to visit. When we met in May 2018 for a recap he shared the scholarship outcomes and his decision. With gratitude for all the support he received on his journey over the years he remarked, “It really does take a village!" Look What Your Gifts Accomplished! • 6 refurbished MacBooks to the after-school program, allowing students to research and apply for scholarships and complete college applications, to change their lives for good through higher education, professions, and a living wage. Thank you again for making this year richer by helping these budding young students flourish and achieve their dreams! Please send to others, or share on social media.